Like chicken soup, it seems almost every culture has it’s own version of meatballs, and lately I’ve been inspired to play around with different variations. 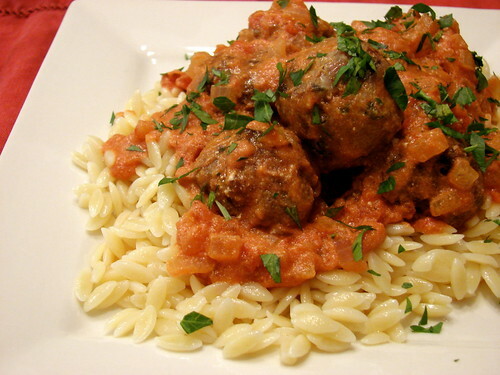 These were made with Hopkins Farm lamb, both the meatballs and the sauce infused with the flavors of Greek cuisine, which I served on a bed of orzo. While I was very happy with the flavors of the dish, I want to work a bit on the texture of the meatballs. This one’s getting a do-over very soon. Oh yum. Orzo is one of my favorite pasta shapes. I will admit to having meatball texture issues. The last ones I made (adapted from a Smitten Kitchen recipe) came out too hard, almost like overdone hamburgers floating in sauce, a delicious sauce, but still. I could never figure out why. Once you figure it out you’ll have to share your newly found wisdom. Lamb makes basically the perfect meatball — such a great complement for the acidity of the tomato. Sometimes it helps me to mix a little bit of a fattier or leaner meat into the balls, depending on what the base is. Texture makes or breaks this kind of a dish, especially since orzo tends to be so tender. I just bought orzo for possibly the very first time! This sounds fun. We base most of our meatballs on Mark Bittman’s version in the original How to Cook Everything, with plenty of garlic and milk-soaked breadcrumbs. My favorite lamb kebabs have a bit of fresh tomato in them, which really helps keep them moist. I totally wing it when it comes to my meatballs, which are, I believe, the tastiest things I cook — measuring by feel, throwing ingredients in — and I’ve never had a “texture” problem. Mine are pretty flaky and loose. Plenty of breadcrumbs (italian flavored progresso from a can is what i use), parmesan cheese, eggs, lots of garlic, red pepper flakes, parsley, and whatever combo of ground meats I have in the freezer. I like cutting the intense flavor of beef and pork with turkey. After browning, simmer in a simple tomato sauce of crushed tomatoes, salt, pepper, sugar. Di-vine. I used to use breadcrumbs in my meatballs until someone told me to use oatmeal in meatloaf, which worked really well, so I started using oatmeal in my meatballs, too. I soak the oatmeal in milk first to soften it. I’m not really sure why oatmeal works better than breadcrumbs but there it is! I mix the lamb with beef. It seems like a better texture to me and still has plenty of lamb flavor. I have been using a panade as well. We have been doing Indian inspired flavors in a tomato/roasted red pepper/ coconut milk curry sauce over basmati.